The Stylebook Supplement on LGBT Terminology is intended to complement the prose stylebooks of individual publications, as well as the Associated Press stylebook, the leading stylebook in U.S. newsrooms. It reflects the association’s mission of inclusive coverage of LGBT people, includes entries on words and phrases that have become common and features greater detail for earlier entries. openly gay/lesbian: As a modifier, “openly” is usually not relevant; its use should be restricted to instances in which the public awareness of an individual’s sexual orientation is germane. Examples: Harvey Milk was the first openly gay San Francisco supervisor. “Ellen” was the first sitcom to feature an openly lesbian lead character. “Openly” is preferred over “acknowledged,” “avowed,” “admitted,” “confessed” or “practicing” because of their negative connotations. See civil union, commitment ceremony, domestic partner, relationships. 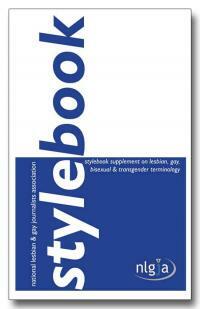 Click here to download NLGJA’s Stylebook Supplement on LGBT Terminology (PDF). Printed versions are available on request, email Matthew Rose at mrose@nlgja.org.